This lovely birthday card for your wonderful wife will put her in the mood for an unforgettable celebration! A three-tiered, candle-topped pink cake will let her know how sweet you think she is, while the streamers above create a festive setting. 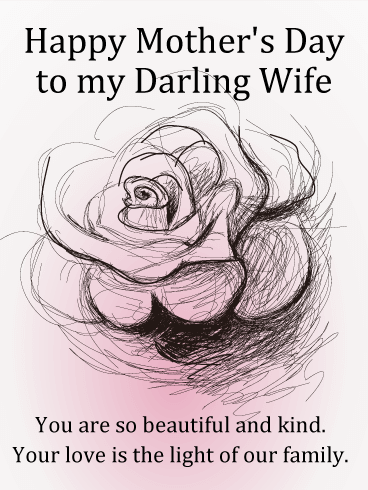 What will really touch her heart, however, is the beautiful message, reminding the woman you are fortunate enough to call your wife that she is an amazing person to everyone who knows her. 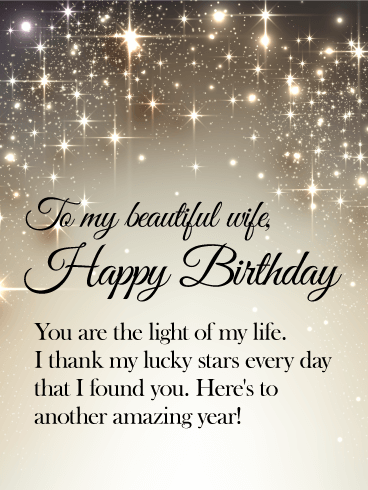 A shimmer of stars in the night sky creates a magical setting for this beautiful birthday card to celebrate your amazing wife! She is the one who makes your world complete, who sparkles in every way, and this is the perfect opportunity to tell her, with a heartfelt expression of your love for her, on her birthday and every day in between. Your wife is your best friend, your cheerleader, your partner-in-crime. 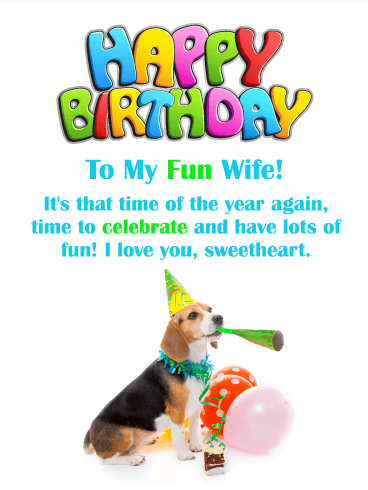 Don't forget to send your wife a fun birthday card! Tell her something fun and wonderful that you've always loved about her. Let her know you're ready to party and celebrate her day in style! She will love a colorful and beautiful birthday card sent straight from the heart. Your wife is your best friend, the one who has been with you through all of life's ups and downs. Parenthood is a beautiful path to walk, but often a difficult one! It's a good thing you have such a wonderful woman by your side to make the journey with you. 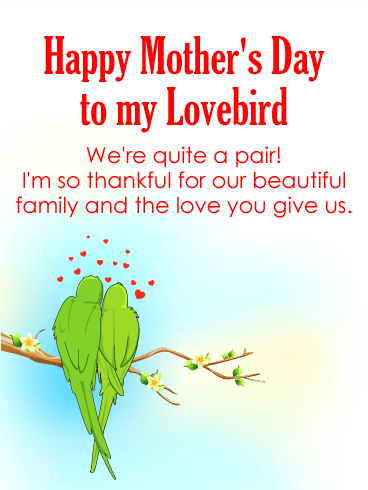 Send this sweet mother’s day greeting card to your wife and celebrate the love you share raising your children together. Does your wife inspire you to be a better man? 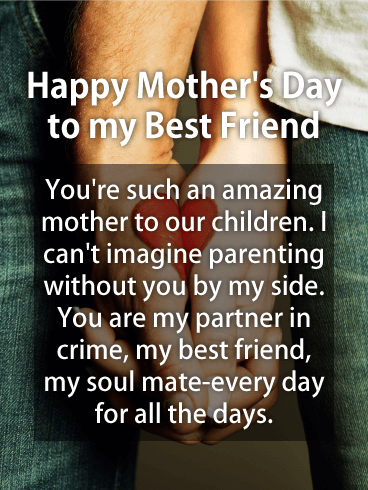 Send a mother's day greeting card to your wife and let her know she is truly something special. This mother's day card for wife is a precious way to say "I love you" to the mother of your children, the one woman you can count on above all others in this world. A bold and bright mother's day card for your wife! Send this beautiful mother's day card to your wife to tell her how lucky your family is to have her! These gorgeous watercolor flowers and the loving message will make it a mother's day she won't forget. 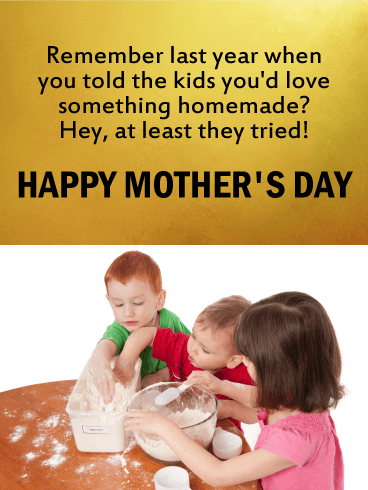 Send your wonderful wife a happy mother's day greeting card today. She'll love your thoughtful touch and sweet words. Mothers give and nurture life which is way we celebrate them every spring! 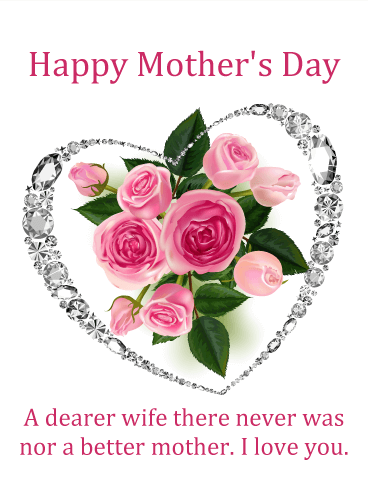 Send your beautiful wife this cheerful mother's day card to honor her life. Let your wife know how much you care with a very special and personal mother's day greeting card that boasts gorgeous pink tulips and sweet words of love. This card is sure to charm and delight your wife. Once a mother, always a mother. If you've cherished watching your wife's life unfold throughout these years as a mother, then this sweet and simple mother's day greeting card is for you. A delicately sketched rose in full bloom speaks of love blooming anew every day, fragrant and sweet to the soul. Shower your wife with love and send her a beautiful mother's day greeting card this year. She certainly deserves it. You and your wife are birds of a feather. 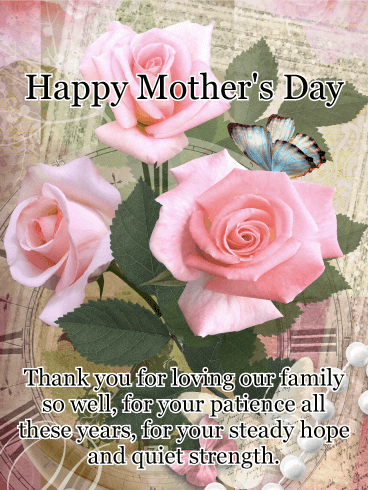 Keep your love strong and send a sweet mother's day greeting card to your dear wife! These two lovebirds are happy just to sit and dream together. You and your wife have created an incredible life together. Your children and you look up to her for strength and guidance. Take a moment and let your wife know you cherish her deeply-send her this thoughtful mother's day card today. Mothers are like sheltering wings, they protect and comfort and keep us safe. 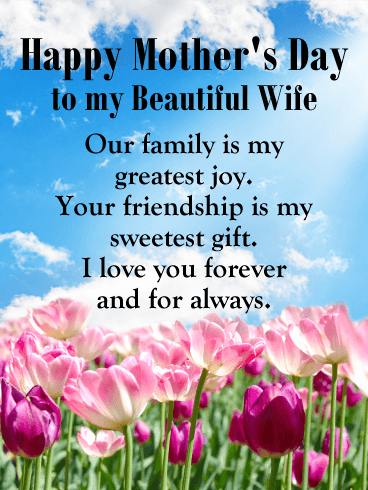 This mother's day card to a wife from her husband is a lovely way for you celebrate her endless love and make her feel awfully special this mother's day. 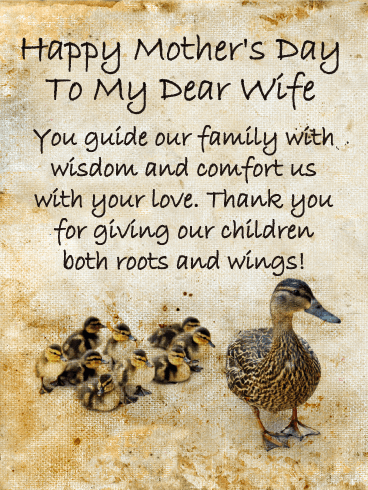 Your dear wife will love this precious mother's day card of a mama duck with her fluffy ducklings. Like a pearl, your wife is a precious and rare gift. Together you've raised a beautiful family so let her know how much you adore her and the amazing mother she is to your kids. Send this romantic and sincere mother's day card to your wife; she's sure to love it. Mother's day is the perfect time to celebrate how much more beautiful the world is because your wife is in it! Stunning, precious, beautiful-a mother is all these things. 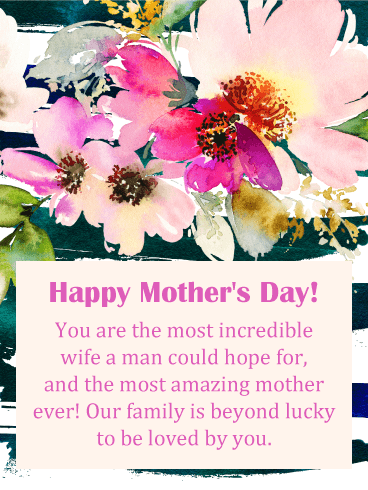 How wonderful to celebrate your wife on mother's day with a gorgeous greeting card! Roses in full bloom and glittering diamonds will take her breath away, but we all know it's the thought that counts and the sweet words of affection! 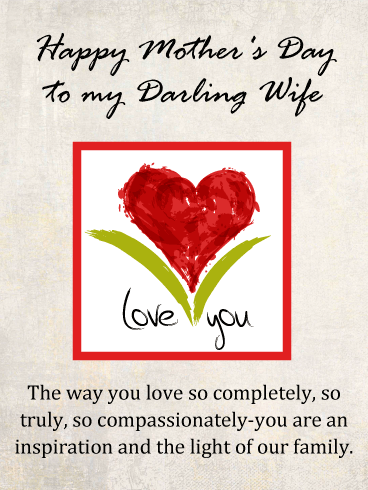 Let your wife know how much you adore her with this amazing mother's day card. This vintage and romantic mother's day greeting card for your wife is a beautiful way to express your love. Love bears witness to life. You've been by her side all these years as her confidant and support and know her best. Let her know you cherish her with this stunning mother's day card and that you recognize all of the beauty her love has created in your and your children's lives. Giving your wife flowers for her birthday will make her feel very special, and this happy birthday card will accomplish that and more. It will make your wife feel loved and thankful to have such a wonderful husband as yourself! This beautiful happy birthday card features a lovely image of flowers in a vase along with a decorative gift box. Send this pretty birthday card her way so she will know how much you adore her! If you love to buy your wife lots of special presents for her birthday, then this birthday card is for you! It features a variety of fabulous birthday gifts that will have your wife excited about her birthday! The best present of all is the fact that it says you feel your wife is easy to love and that you look forward to spending every day with her. This birthday card will take her birthday to the next level! 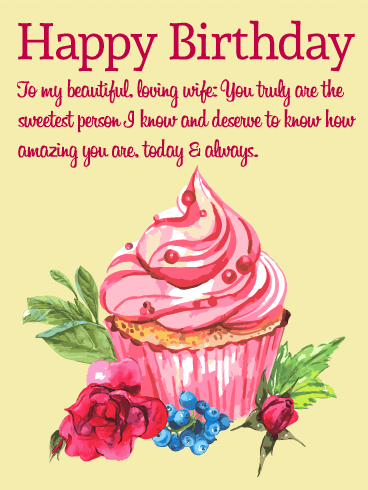 Add a little magical sparkle to your wife's day with this pretty happy birthday card that was designed for the one you love! Glimmering lights bursting out of the pink gift box represent the excitement of the day! 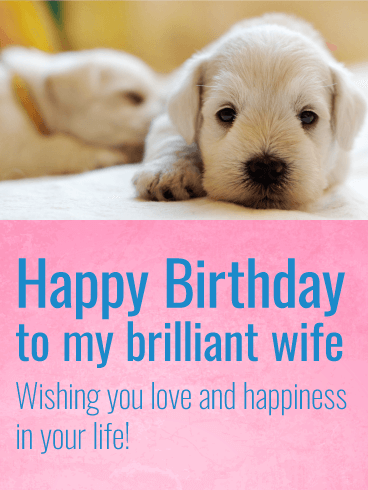 This fantastic birthday card wishes your wife a magical day where all her birthday dreams come true! 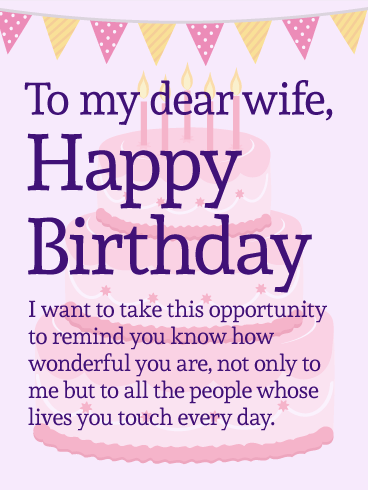 Your lovely wife is going to adore you after she sees this birthday greeting card! If this puppy wasn't cute enough, just put a LOVE sign in front of him and he will melt your wife’s heart! She will love you even more for sending this adorable birthday card her way. 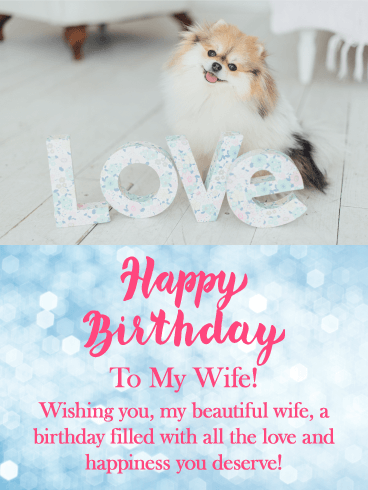 The sparkling blue background adds an element of excitement and the message of love will be sure to make your wife feel special on her birthday. So send this loving puppy on his way to wish your wife a happy day! 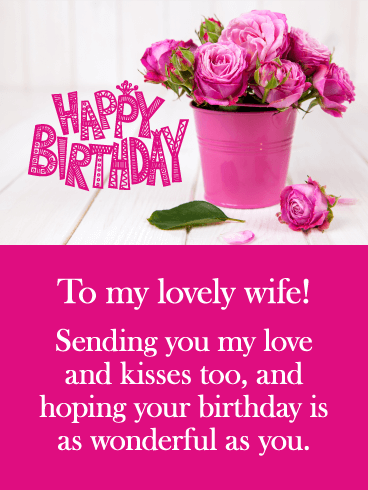 Beautiful pink pastel roses against a sparkling background create this eloquent happy birthday card that your wife will adore. It will let your wife know that with each year that passes, you are falling more in love with her. This meaningful birthday card will bring a tear of joy to your wife's eyes. So send these exceptional roses and thoughtful words to your dear wife for her birthday! A pretty cupcake, a spectacular sparkling background, and a message of love, what more could a wife ask for! 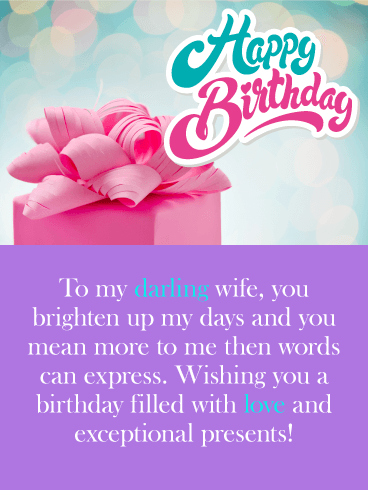 This exquisite birthday greeting card will make your wife love you even more! It features a fantastic image of a decorative cupcake and the most beautifully lit background, she will be very impressed that you chose such a fantastic birthday card. Best of all, this happy birthday card tells your wife that you have loved her from the very beginning! Nothing says birthday more than lit birthday candles! They represent the importance of the occasion and make this birthday card worth sending! The colorful birthday confetti perfectly frames the loving message that was written just for your wife on her special day! 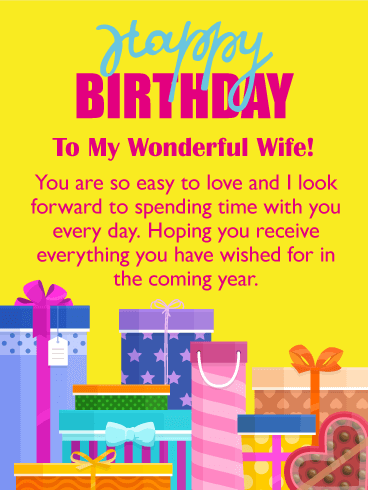 Remind your wife that you love her with all your heart by sending this awesome birthday card her way to start her birthday off with a smile. Your wife's birthday is a big occasion so there's no better time than now to break out the birthday champagne! This exciting birthday card will certainly get the celebration started the moment she sees it. A champagne bottle bursting with colorful balloons and a decorative birthday banner add to the party atmosphere and will remind your fabulous wife that it's time to start the celebration! 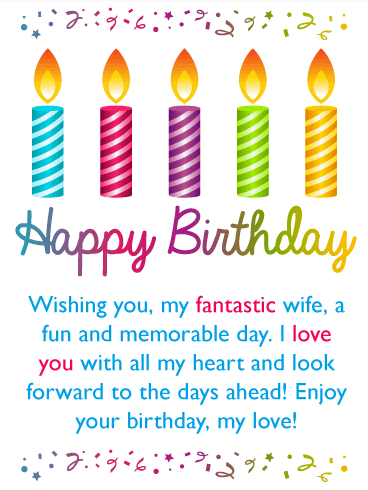 Be sure to send this vibrant birthday card to your wife soon! Are you feeling lucky? You should, you have a great wife that is so very precious to you! Let her know how much you appreciate all that she does for you, and that you are thankful for her with this bright and joyous birthday card! The colorful gift will be sure to make your wife smile as it reminds her of the presents she will be opening on her special day! Your wife is going to love this birthday card! 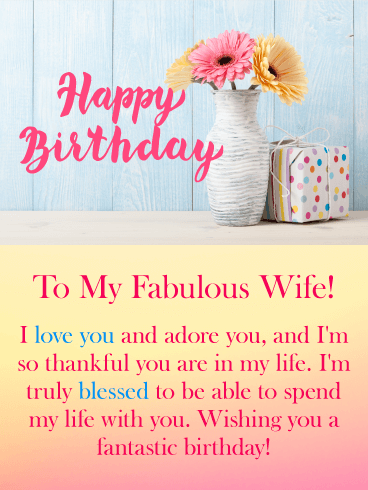 Your darling wife can't wait to receive her birthday presents on her special day and this birthday card is a great reminder of that. 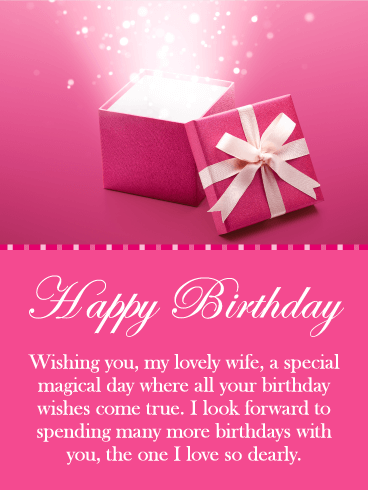 A pretty pink gift box with a glittering blue background come together to create a wonderful birthday card image. 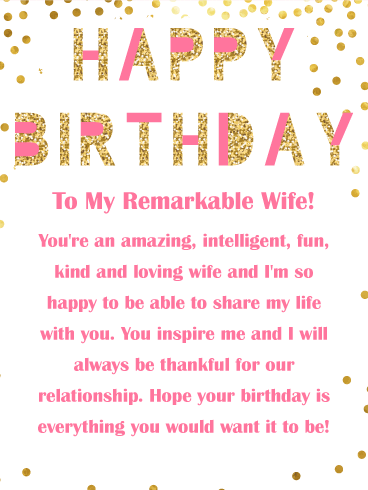 This happy birthday card is also perfect if you want to let your wife know that she means more to you than words can express! Such a great birthday card! If your wife has a busy schedule then she will appreciate the reminder that her birthday can be a day of relaxation! This sweet kitten resting on a comfortable chair will certainly get the message across when she views this terrific birthday card! The pastel colors and creative text add a festive look that your wife will absolutely love. She will be thankful to have a husband who was thoughtful enough to send her such a nice birthday card. 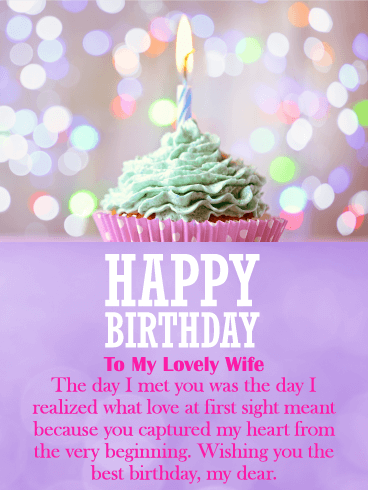 Send your love and kisses to your wife on her special day with this beautiful happy birthday card! The pink roses look gorgeous and your wife will certainly enjoy them! The decorative Happy Birthday letters add a creative element to this birthday card that makes it a must send! 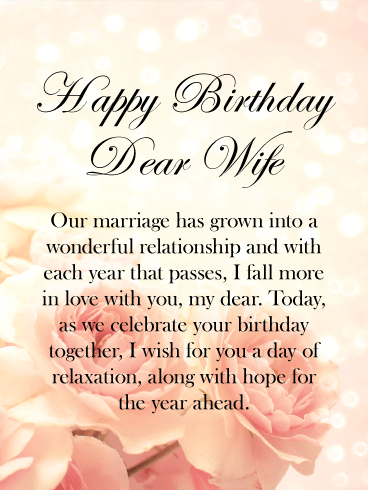 This birthday card is the perfect way to wish your lovely wife a wonderful day, so make sure to send it out today! 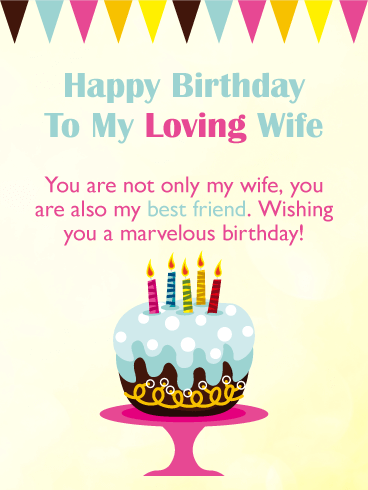 Wish your wife an awesome birthday and a lovely year with a birthday card that will add excitement and joy to her special day. 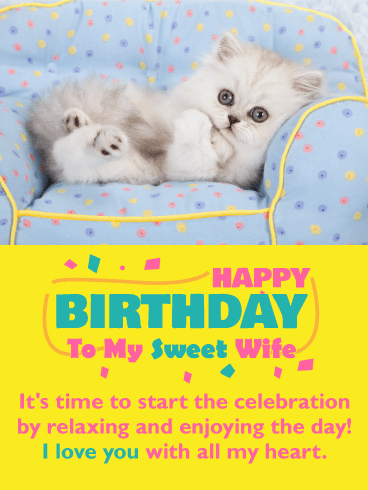 The colorful balloons framing the Happy Birthday To You message will have your wife looking forward to the celebration at hand! Most importantly, this birthday card says that you are thankful for another year and the chance to create more memories with your beautiful wife, this will make her day! Send these lovely flowers to your wife on her birthday, it will brighten her day and make her feel great. 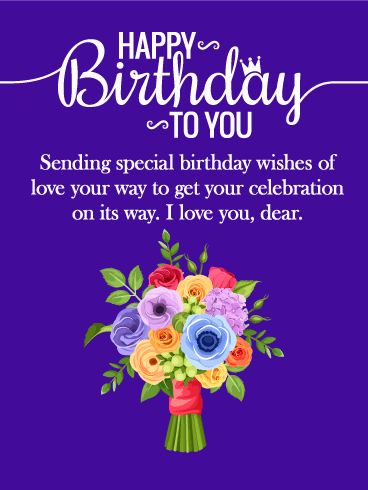 You will not only be wishing her a happy birthday and sending flowers with this birthday card, you will also be sending your love, the most important element. 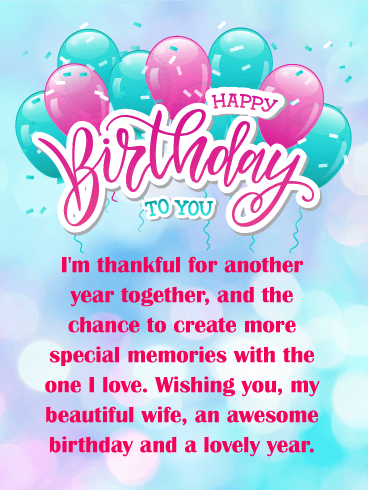 So as her husband, you should make sure to send this loving happy birthday card her way to make it in time for her special day! 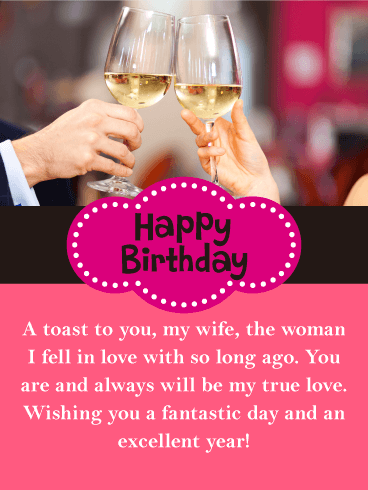 Wish your wife a happy birthday with this wonderfully designed birthday card, it will be sure to make her extra happy on this terrific day! This special birthday card features a meaningful message that explains how your love has been growing stronger each year! This is something every wife would love to know on their birthday. The beautiful cake is lit and ready for your wife to make her birthday wish! HAPPY BIRTHDAY To My Remarkable Wife! - You're an amazing, intelligent, fun, kind and loving wife and I'm so happy to be able to share my life with you. You inspire me and I will always be thankful for our relationship. Hope your birthday is everything you would want it to be! This little puppy is eager to start the birthday celebration! 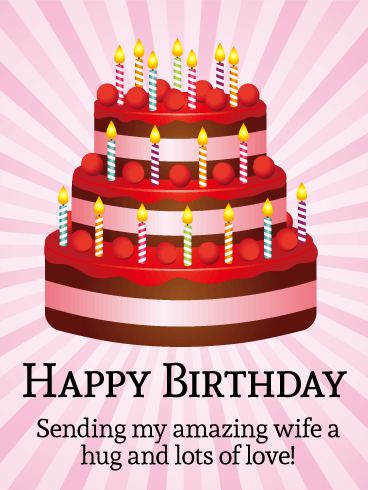 Don't make him wait a second more, send this awesome birthday card out to your wife now! It features a fun image of an adorable dog wearing a birthday hat and ribbons! In addition to this, the birthday balloons add a splash of extra color that gives it a more festive look. 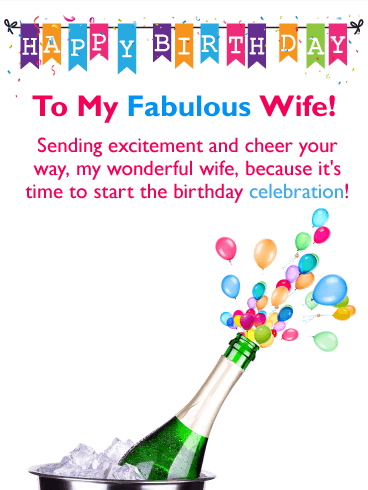 This birthday card was designed to show your wife how excited you are about her special day! Your wife is a supportive, caring thoughtful person, and this birthday card is a way to acknowledge that and thank her for all the joy it brings you. It features spectacular patterns of pastel colors that add an element of creativity. 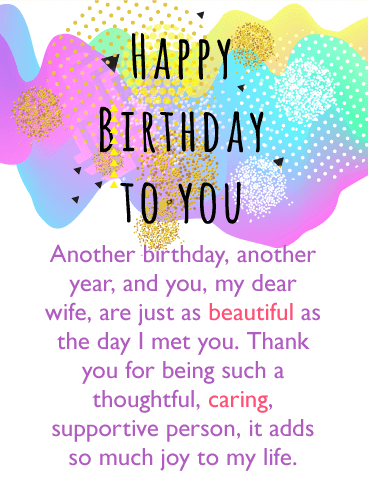 In addition to this, by sending this wonderful birthday card, you will be telling your wife that she is just as beautiful as the day you met her. It will melt her heart! Treat your wife to a beautifully decorated birthday cake on her special day! This great happy birthday card has all the elements she would need to get her birthday celebration started, like cake, lit candles, and a birthday banner! Even better is the heartwarming message that says she is not only your wife, she is your best friend. Your wife will adore you for sending her such a special birthday card! If you are looking for a birthday card that will catch your wife's attention, then you have just found it! 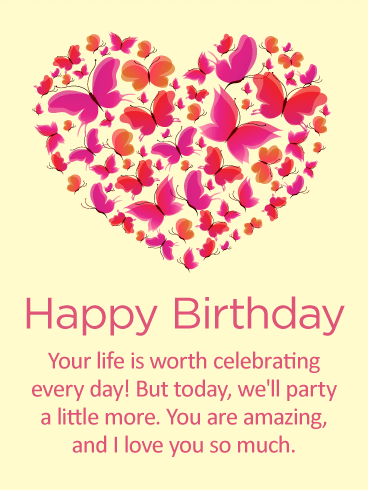 This vibrantly colored birthday card features hot pink colors that stand out and look lovely. The image features a couple toasting with their wine glasses, must be a special occasion! 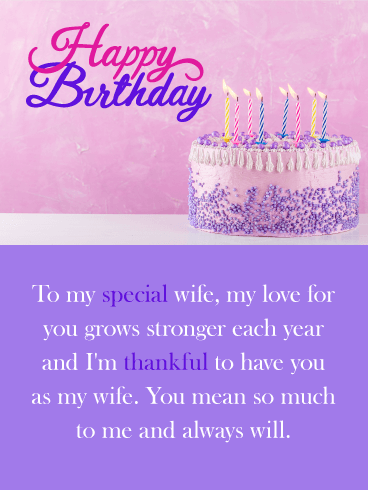 This exceptional happy birthday card displays a message that will remind your wife that she is your true love and always we be! 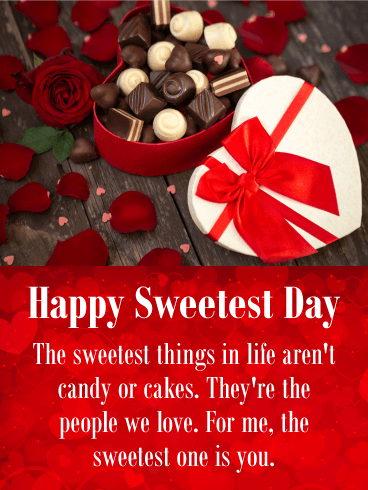 The sweetest things in life are the people we love. 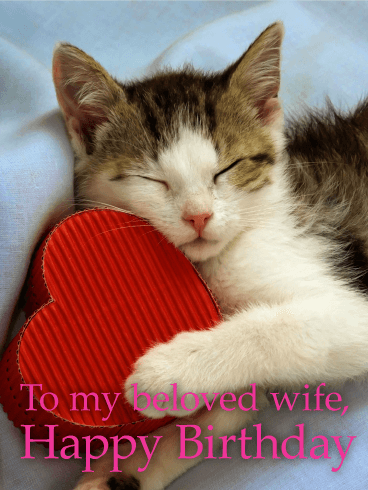 Let your wife know she's the love of your life with this Sweetest Day card. This romantic card is set on a red heart background with a box of chocolates and beautiful red roses and rose petals strewn across a deck, perfect for setting the scene for a romantic evening with your wife on Sweetest Day. Your wife is the one person you vowed to spend the rest of your life with. Tell her you still want to spend every single day with her with this Sweetest Day card. She'll be delighted with your message of love on a pink background. Heart balloons of pink, champagne, and red floating toward the sky bring your Sweetest Day message for your wife to life. For the woman in your life who's captured your heart, this sweet birthday card is the perfect way to say happy birthday! Nothing is more adorable than a tiny, cuddly kitten. Make your wife smile with the fun colors and red heart being held by the cat. She'll absolutely love it! If the adorable Labrador puppies aren't enough to make your wife swoon, the kind words definitely are! After all, calling her brilliant and wishing her love and happiness are a surefire way to make your wife feel special on her big day! The pink and blue colors provide a nice contrast, while the neutral tones on the top half of the card add an elegant softness. This one is a great pick! 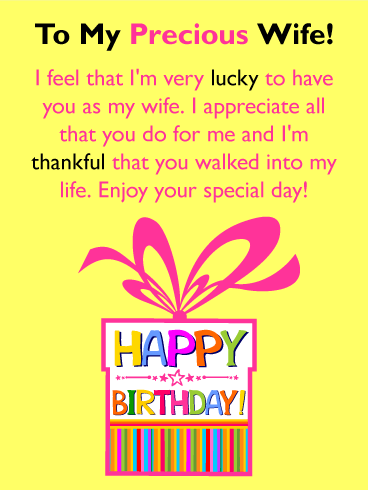 Each year, you have a special opportunity to wish your wife a wonderful birthday. This beautiful birthday card is the perfect way to remind her just how much she's loved. A subtle cream-colored background lets the pretty pink lettering of your heartfelt message stand out. Underneath, a pink frosted cupcake surrounded by charming flowers creates an even sweeter sentiment for the woman who you care about more than anything. There's no sweeter woman than your wife...and this awesome birthday card is the best way to let her know! Layers of cake and candles shine at the center, highlighted by a festive pink striped background. Below is a simple yet meaningful message, which tells your wife that you think she is absolutely amazing and this year, as every year, you're sending along plenty of hugs and lots of love her way!